Falcon.io First to Market with Advanced Instagram Measurement. Brands can now measure every detail on Instagram including reach, engagement and CTA clicks. Even though it’s only been about a month since our last major Instagram announcement, we’re eager to share more exciting news. 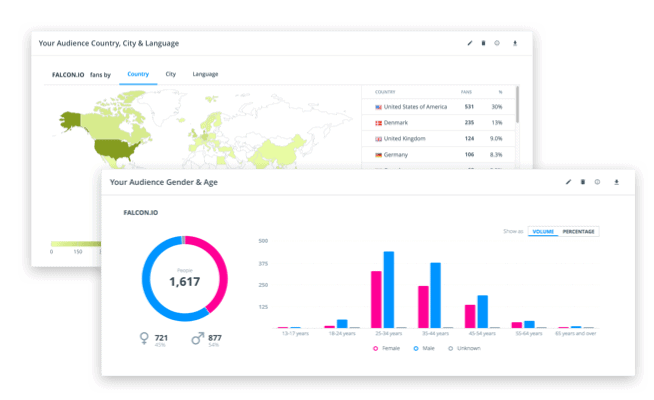 Starting today, brands can use Falcon.io to measure every single detail of their Instagram marketing – including reach, engagement and profile CTA clicks. This level of detail for Instagram Measurement is an industry first. The metrics previously available were limited to a few high-level figures like follower growth, likes, and comments. But as Instagram has grown in importance for marketers and brands, the demand for more insights on reach and engagement has also increased. So when Instagram offered us to join the exclusive Alpha development program for their new API platform, we were thrilled about the opportunity. For every piece of media published on Instagram, brands can now benchmark reach, impressions, overall engagement, likes, comments, video saves and views. On a channel level, we now measure follower count, reach, impressions, profile views, messages, website clicks and contact clicks. As for followers, we analyze gender, age, location and online activity levels. But actually, that is not all. For the first time ever, brands can now save and monitor the performance of their Instagram Stories. That’s right! Every single time your brand publishes an Instagram Story, we store a copy in our reports along with its key performance metrics such as reach, impressions, replies, taps back, taps forward and exits. In short, everything you need to know to understand the engagement on your ephemeral content. So, if you’re looking at a whole year’s activities, you can scroll back, find the best performing Stories, replay them and learn from your past. To cater specifically for the use case of Instagram Stories, we decided to create a whole new visualization module in our reports, which we are calling “the slider”. It’s an interactive module that displays your stories in horizontal succession and lets you sort by chronology, reach or engagement while comparing specific performance metrics story by story. This addition – along with the Instagram Publishing features we announced last month – makes Falcon.io the only marketing platform in the world that enables full lifecycle management for Instagram Stories. More than 250 million users consume Instagram Stories every day. That’s more than all of Snapchat’s users combined. And even better: The users really love authentic visual brand storytelling. So there’s really no reason left why this shouldn’t be your next big marketing bet. We are excited to continue providing new innovative features to further enhance your brand via social marketing. We are thrilled to be partners with Instagram and eager to continue building on our relationship so we can create the best platform for all our customers.